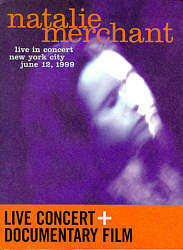 Natalie Merchant Live In Concert: Warner Music, widescreen 1.66:1, languages: English DD 5.1 & Dolby Surround, subtitles: none, single side-single layer, 12 chapters, rated NR, 64 min., $24.99, street date 11/9/99. James Taylor Live at the Beacon Theatre: Sony, standard 1.33:1, languages: English DD 5.1 & Digital Stereo, subtitles: English, French, single side-dual layer, 27 chapters, band bios, exclusive promotional videos, behind the scenes interviews, complete discography, rated NR, 110 min., $24.98, street date 10/6/98. When Natalie Merchant played a four-night run at Broadway's Neil Simon Theater, it was one of the concert events of the year, drawing national acclaim for her intimate, impassioned performance. This DVD is the companion piece to--and substantially different from--her live album of the same name. James Taylor Live at the Beacon Theatre: On May 30, 1998, James Taylor and his band took the stage at New York's Beacon Theater for an extraordinary concert of greatest hits, personal favorites and live surprises. The magical evening became the first-ever concert to be broadcast live nationwide on the PBS network. This DVD edition contains 25 full-length James Taylor performances, including three not originally seen on the broadcast, complete with on-stage warmth and wit that have made James Taylor one of the world's most beloved entertainers for more than three decades. The Merchant program effectively transmits the live experience with little gimmickry. I've seen many concert videos in my day, and far too many of them attempt to spice up the action with silly production decisions: lots of rapid cuts, strange visual effects, etc. These rarely work and usually harm the presentation to a great degree because they completely eliminate any vestiges of the original show. When I watch a concert video, I want to see something that depicts as accurately as possible the actual performance. No live show can ever be truly replicated at home; if multiple angles become more prevalent, we'll get closer to that, but it'll never really happen. Nonetheless, some offerings do a better job than others, and NM works pretty well in that regard. Merchant's a fairly subdued performer, and this is a pretty subdued video. That's a good thing, because it lets the viewer focus on the important aspects of the show without becoming distracted. Visual gimmicks are happily nonexistent; slow motion is utilized on occasion, and that's about it. If you want a nice representation of a Natalie Merchant show, this DVD will give it to you. Unfortunately, if you want to see Natalie Merchant in focus, you'll have to attend one of her concerts, because while the presentation of this show is positive, the appearance of the video is not. NM appears in its filmed aspect ratio of about 1.66:1 on this single-sided, single-layered DVD; the image has not been enhanced for 16X9 televisions (probably because a program needs to be at least 1.77:1 or more to benefit from that). Rating image quality of music videos can often be awfully difficult because many of them intentionally look bad; the producers made a production decision to go for a certain "look" that they valued over image clarity. Sometimes I can tell that a DVD has gone badly awry for reasons other than artistic because I have material that shows this; for example, I was able to compare the Janet Jackson Velvet Rope DVD to the HBO broadcast I taped and note that the VHS actually looked sharper than the DVD! While I can't make such A-B comparisons with NM, I can state that it looks surprisingly bad for a brand-new presentation. Sharpness is usually quite dull and soft; the picture doesn't look blurry, per se, but it seems very flat and lifeless. Despite that, moire effects occasionally crop into the image; microphones shimmer and various objects like cymbals display jagged edges. The picture looks quite grainy much of the time. This seems excusable at the beginning and end of the program - the concert is bookended by black and white shots of Merchant fans outside the venue - but makes no creative sense for the show itself. The grittiness becomes especially noticeable and distracting during the slow motions scenes, where it really stands out strongly. Colors consistently seem very flat and desaturated. Most of the show doesn't offer much color, really, but even objects like Merchant's orange shirt appear pale and dull. Black levels are probably the most successful aspect of the image, but even they look milky and gray much of the time. Shadow detail is adequate but also vague. How much of this poor quality was a production choice? I'd estimate that some of it resulted from creative decisions; they might have felt that the desaturation and fuzziness gave the program a more "dreamlike" quality. But since some shots - not many, but some - actually look pretty sharp and clear, that greatly causes me to question the notion that this weak video quality was intentional. Whatever the case, it looks pretty bad. Not so the quite strong Dolby Digital 5.1 mix. (NM also offers - and defaults to, in fact - a Dolby Surround 2.0 track, but stay away from it, even if you don't have a Dolby Digital receiver; it's extremely flat and lifeless.) The music sounds very good on this DVD and presents a nicely broad stereo soundstage for the front channels. Instruments are spread evenly across the forward area and all appear well-defined. The audio quality seems very clean, clear, natural and warm; I could have used a little more low end, but the sound nonetheless appears very accurate and well-reproduced. The surround channels are reserved for some very gentle reverberation effects - mainly of the drums - and applause between songs. While I honestly prefer ambitious music mixes with 5.1, I understand that many folks like to have this kind of semi-recreation of the concert hall experience, so I won't fault the DVD for failing to go nuts. All in all, I found the Natalie Merchant Live audio to be terrific. NM completely lacks supplements. It doesn't even provide subtitles for songs, which is something I think should be an absolute given. The DVD comes in an unusual package. It's cardboard but not a "snapper;" there's no way to keep the case closed. It opens like a "snapper" but also includes a center page. I've never seen a package like it. (When I mentioned this to the friend from whom I borrowed the DVD, he stated that it was "environmentally-friendly." He was joking, but I would have believed him; that seems like the kind of thing Merchant would do.) The interior of the case features a few pictures, credits and a song listing. James Taylor Live also nicely presents his live show. In comparison with the Merchant video, however, I was less enamored of the actual production because it seemed far too desperate to "liven things up;" whereas the producers of the Merchant program were pretty content to casually document the proceedings, the Taylor video appears overly kinetic. Taylor is a pretty laid-back performer; as such, standard music video techniques seem inappropriate for a film of his work. The program doesn't go overboard with the MTV-style presentation, but I still felt it looked too eager to seem flashy. The edits aren't "rapid fire," but they seem overly frequent; the camera rarely rests on one subject for long. The camera also rarely rests; most of the shots in this video come from a camera that's moving in some way. This approach seems acceptable for livelier songs like "Your Smiling Face", but detracts from the slower tunes. Still, it's a decent presentation. I wish the director had eased off the caffeine that day, but it still seems watchable once you get used to the pace. Even though I disliked the music, this video put me in the mood to go to a concert, and that's a good effect. 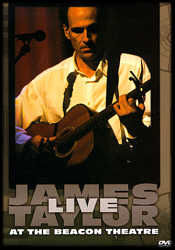 James Taylor Live At the Beacon Theatre appears in its original aspect ratio of 1.33:1 on this single-sided, dual-layered DVD; since it's fullscreen, the program does not require 16X9 enhancement and none is present. In regard to its picture, the Taylor program succeeds to a very great degree and blows away the flat, blah look of the Merchant disc. The image seems consistently very good and nicely reproduces the concert. It looks sharp from start to finish and displays no signs of moire effects or jagged edges. The source material seems clean and fresh; I discerned no problems with it. Colors are generally subdued, but appropriately so, since this isn't a flashy show. These hues look accurate and adequately saturated, with no signs of bleeding or other problems. Black levels are also just fine, and shadow detail seems good. James Taylor live isn't a stunningly strong picture, but it's always quite nice and seems very watchable. Even better is the terrific Dolby Digital 5.1 mix. (The DVD also offers a good PCM stereo version, but I preferred the Dolby track.) As much as I liked the Merchant audio, the Taylor program tops it in every way, especially in regard to bass. The low end seemed a little weak on Natalie's DVD, but I have no complaints for James' show; the bass is extremely deep and solid, with no boominess or excessive rigidity. Happily, that rich low end in no way negatively affects the rest of the audio, which is crystal-clear and well-defined. As with the Merchant program, the front channels dominate with a neatly spaced stereo presentation; instrumentation is localized but not excessively so and it blends together well. Taylor's vocals are crisp and clear, as are all of the instruments. Surround usage remains fairly subdued, though it's a little more ambitious than the Merchant DVD; while we mainly hear crowd noise from the rears, some percussion and backing vocals also stem from those channels. James Taylor offers what is probably the second best DVD musical audio I've heard, trailing only the amazing "Roy Orbison: Black and White Night" program. And the DVD even packs in a few supplements! It's not a cornucopia, but I was pleasantly surprised at the breadth and quality of the extras presented on James Taylor, especially since most DVDs go the Merchant route and offer little to nothing. First of all, the DVD provides eight minutes of a decently interesting interview with Taylor. He talks about his band, how he chooses which songs to play, and other topics such as his fun appearance on a 1994 Simpsons episode. Although I don't like the man's work, I found these bits to be fairly enjoyable. We also see two music videos from Taylor, one for "Copperline" and another for "Enough to Be On Your Way". The quality of these clips is pretty spotty. Both offer PCM stereo sound that's decent but not great - it certainly pales in comparison with the concert itself. "Copperline" is a pretty standard performance piece that shows James and the band singing the ditty around a campfire; the image looks pretty blah and blotchy. A bit more interesting is "Enough to Be On Your Way", a semi-conceptual video that features Barbara Hershey. It also looks a lot better; while the quality isn't great, it's still pretty good. A very nice biography of Taylor appears, as well as shorter but still solid listings for most of his band members. We also receive a nicely annotated discography for Taylor. It mentions all of his albums and singles and even notes well-known participants in each of the projects. All of these text pieces seemed well thought out and add to the presentation. Finally, James Taylor does what the Merchant video didn't: it includes subtitles for the lyrics to all of the songs. Not only that, but it includes subtitles for all of Taylor's between songs banter. Not only that, but it includes subtitles for all of these things in both English and French. Great job, folks! Here's the bottom line on these DVDs: Natalie Merchant Live offers some good sound but a pretty bad visual experience and absolutely no supplements. A live compact disc from this concert arrived concurrently with the video, and I'd certainly like to steer Merchant fans toward that; it's cheaper and would reproduce the sound nearly as well, I'd guess. Unfortunately, Merchant's merchandisers make this unpalatable for her big fans; the DVD and the CD do not share the same track listings. The DVD provides five exclusive songs, whereas the CD features four tracks not found on the video. As such, Merchant fans may want this one just for the different songs, but it's not a very watchable program. Much better is the very well-presented James Taylor Live At the Beacon Theatre. I have absolutely no qualms recommending it to his fans. The picture looks very good, the audio is absolutely fantastic, and it even tosses in some nice extras. Look at it this way: this DVD is so good that I actually briefly wished I liked the man's music. If a sentiment like that from a long-time JT hater like myself doesn't count as a strong endorsement, then what does? Yahoo! Natalie Merchant--A comprehensive directory of Merchant web sites. James Taylor Online--A terrific site with the latest news, tour dates, albums, newsletter, FAQ, sounds, gallery, aritcles, forum, and much more. Amazon.com--Available to purchase are the Natalie Merchant and James Taylor DVD at special discount. Reel.com--Purchase the Natalie Merchant and the James Taylor DVD at special discount.